People have all sorts of preferences from clothes to food and beyond. Why do we expect dogs to be any different? After all, each pet has a unique personality of their own. Emma has two speeds: go and stop. It makes me giggle to watch her spring around the house, bouncing from toy to toy. However, the second she’s had enough, she’ll trot over to me on the couch, curl up and go to sleep. I’m sure you’re pets have different habits that make you laugh too. Just like their personalities are different, so are their play styles. Some pets like stuffed toys, others like hard bones, and still others prefer one with a squeaker. But, how can you know which toy is for your dog? Read thru these categories and leave a comment telling us which one you think your pet would enjoy most and why. On Monday, February 25, we’ll pick a random comment to win the toy they listed! We can’t wait to hear about your pets. Plush toys are great for puppies or senior dogs who need a gentler toy. Soft plush toys are usually filled with some sort of stuffing, and often have squeakers inside. 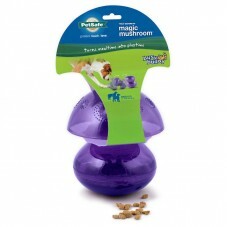 They can be great for puppies or senior dogs who need a more gentle toy. Some dogs like to carry them in their mouth and bite them to make the squeaker squeak. Others, like Emma, feel the immediate instinctual behavior to destroy the toy as quickly as possible. If your dog loves to dig your socks out of the dirty clothes or migrates towards your pillows at playtime, plush toys are perfect for your pet! For more exercise, some dogs like to “work” for their food and this gives them the perfect opportunity. Plastic food dispensing toys are a great pet weight loss tool, because it makes them work for their food. manipulate the toy to get the food out. This is just as much of a mental exercise as it is a physical one. It’s perfect for dogs in small homes as it gives them the opportunity to engage in more activity. It is also great for pets who are trying to get rid of a few extra pounds. Some dogs push it with their nose or paws, while others pick them up and throw them (this is usually Emma’s technique).If your dog needs more fun at mealtime, this is the perfect toy for them. Strong durable rubber gives pets the opportunity to chew something they are actually allowed to chew. They come in a variety of shapes, sizes and colors. Our Busy Buddy® line has treat dispensers to hold kibble or something more lickable – like peanut butter. Yum! If your pet likes to chew, this is the perfect toy for them. For really determined chewers, nylon toys are the best! For really durable chewers, the nylon toys are made of hard nylon to satisfy their chewing urges. Some come with rawhide rings to keep your pet engaged. These toys also let your pet chew on something that is appropriate and still get the same satisfaction of destroying it. If you frequently find tennis shoes, corners of furniture and other household items with bite marks or completely destroyed, you pet needs a rubber chew toy ASAP! Now, it’s your turn.! Tell us which of the toys your pet would enjoy most and why in the comment section below. On Monday, February 25, we’ll pick one winner in each category to win the toy they selected. ABOUT NATALIE As the PetSafe Brand Communications Specialist, Natalie manages the PetSafe brand across multiple social and content sites, including The Paw Print blog, Facebook, Twitter and Pinterest. She also generates other brand related content including product information for retailers, video scripts, and public relations. Before PetSafe, Natalie worked in the local media covering politics, education, and religion. Natalie’s puppy, Emma, spends almost as much time in the office as she does.